There are two pieces of the Parkway; the western part is signed as such and provides a useful bypass of Peekskill. The eastern part has exactly 0 signs for it in either direction from US 202/NY 35, either as the Bear Mountain Parkway or as a way to the Taconic State Parkway. Maybe that's because 202/35 have their own interchange with the Taconic, close both along the Taconic and along 202/35. It's odd, though, to come across a four-lane highway in semirural New York with not so much as a green signblade to point the way. Highland Ave. heading into Peekskill. After crossing under the vintage bridge, the assembly gives you a few too many banners - why not just a single shield with an arrow? 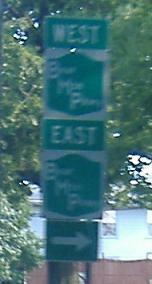 The interchange is 5/8 of a cloverleaf, with all four movements on the EB side of the Parkway. The one westbound movement allows left and right turns from the Parkway onto Highland, but that means that, as this sign shows, traffic from both directions of Highland to the westbound Parkway have to go up the SB-EB "loop", and indeed come to a stop sign at the Parkway. Modern interchange design, it ain't. N. Division St., the next exit east of Highland Ave., facing away from Peekskill toward, er, Lake Peekskill. 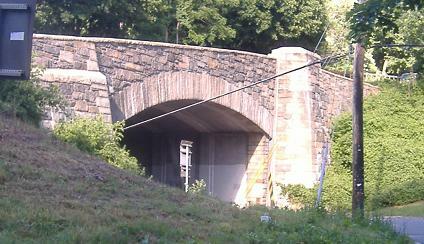 Eastbound shield on the approach to that stone overpass. 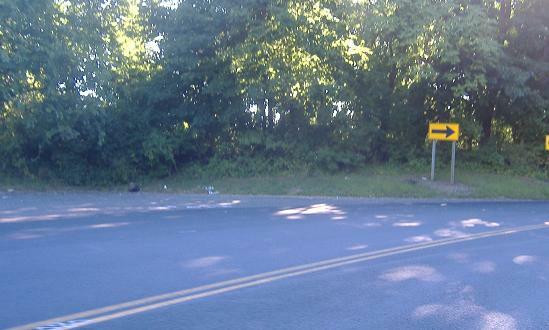 The eastern stub end of the western segment of Bear Mountain Parkway. Bear Mountain Parkway would have continued east as a four-lane highway, and to the right most likely would have been the EB exit/entrance for US 202/NY 35. It would have roughly paralleled Old Crompond Rd. on the south side of 202/35 and then crossed back to the eastern section. According to Steve Anderson's website, the completion still isn't dead.